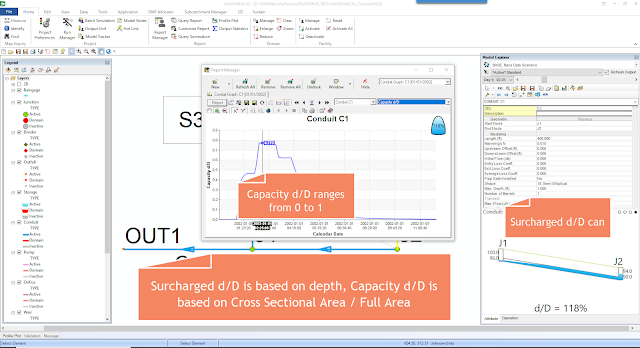 Problem: As SWMM5 is a link node network, the area of a Storage Node is both the area of the Wet Well and typically ½ the surface area of the connecting links. There is no surface area for the Pump(s) downstream of the Wet Well (Storage) but the area of the upstream links will add to the surface area of the Wet Well. One Answer: You can eliminate this issue by adding a in a Dummy link to connect the upstream Gravity Main links to the Wet Well. The Dummy link has no surface area and sets the Outflow of the link to the Total Inflow of the Upstream Node to the Dummy link. The Wet Well will then only have the surface area of the Wet Well.